Soon it will be Hanukkah! Called the “Festival of Lights” this holiday is celebrated with saying prayers, lighting a menorah (a menorah is a candelabra that usually holds 9 candles), playing dreidel games (a dreidel is a 4 sided top with a letter on each side), singing and eating fried foods. Hanukkah in a nutshell: About two thousand years ago after much fighting, the temple in Jerusalem was liberated by the Maccabees from the Greeks and Syrians. To rededicate the temple, oil was burned in the menorah. There was only enough oil to last for one day. Miraculously the oil lasted not one but eight days until more oil arrived. This miracle of the oil is celebrated by lighting the menorah for eight nights. Many Hanukkah foods are fried or made with oil to commemorate the miracle of the oil. The most popular Hanukkah foods are potato latkes (pancakes) and sufganiyot (fried doughnuts). 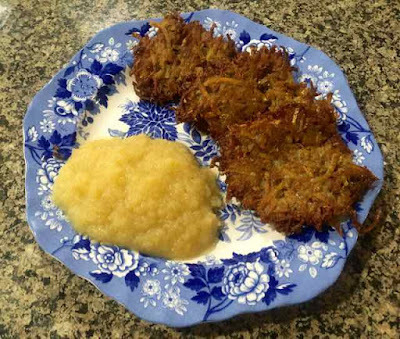 This year I am posting my recipe for Gluten Free Latkes or Potato Pancakes. I bake my latkes on a baking sheet with a thin layer of oil on it. Baking is less time consuming and easier than pan frying when making a large amount for a crowd. The baked latkes are crisp yet less greasy than pan fried ones. Latkes are made with a few simple ingredients, but they taste so delicious. Traditionally they are served with apple sauce and/or sour cream. Today there are many variations of the plain potato latke, including sweet potato, zucchini, parsnip, cauliflower, cheese and even Brussel sprouts. Last year I made vegan (no egg or dairy) latkes for my son and they were really good also. I will include both recipes. 1) Preheat the oven to 450℉. 2) Pour ¼ inch oil into a rimmed baking pan. When the oven is preheated put the baking pan into the oven for 20 minutes to get the oil hot. 3) Wash and peel (peeling is optional) the potatoes. 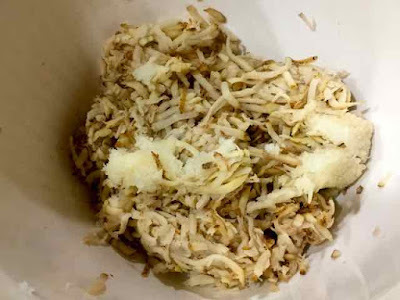 Using a box grater or the smaller grating blade on a food processor, grate the potatoes and place into a bowl of water, this will keep the potatoes from turning grayish. Potatoes grated in food processor, already turning color. 4) Peel and finely grate the onion or run it through the food processor using the blade attachment. 5) Line a sieve with cheese cloth. 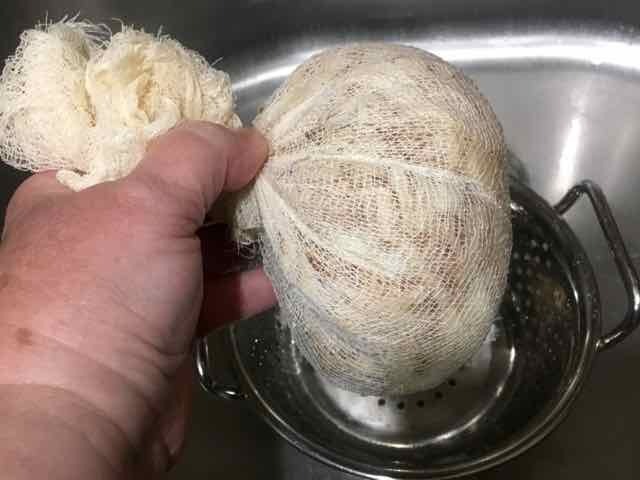 Place as much of the grated potatoes in the cloth as will fit and still allow you to wrap them completely with the cloth. Gather the cheese cloth around the potatoes and form a knot or twist together the gathered ends and squeeze or wring all the moisture out of the potatoes. Repeat with the rest of the potatoes until all the extra moisture has been squeezed out. Repeat with the grated onions as well. Removing as much excess liquid as possible is crucial for getting a crisp pancake. 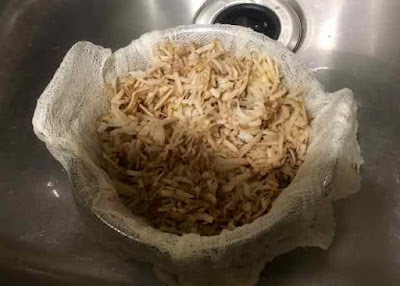 Grated potatoes in a strainer lined with cheese cloth. ready to squeeze the excess liquid out. 6) Add the grated potatoes and onions to a large bowl. Add the rest of the ingredients (except the cooking oil) and mix well. I find it best to use my clean hands to mix this up. Potatoes and onions with excess liquid squeezed out. All the ingredients (except the oil for cooking) in the bowl. 7) Carefully take the oil filled baking pan out of the oven and place on the stove top. Scoop out portions of the potato mixture into the oil and flatten the center. Latke mixture scooped out into the hot oil and flattened a bit. 8) Bake for 6-8 minutes or until browned and crisp. Turn the latkes and bake an additional 5-8 minutes depending upon how dark and crisp you prefer yours to be. Latkes after cooking for 8 minutes. 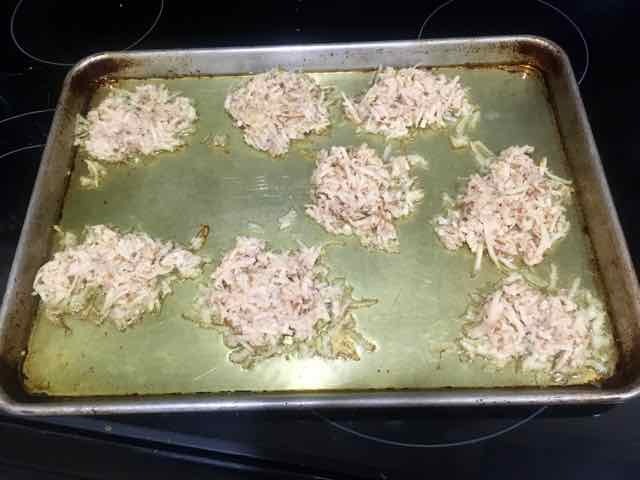 Latkes flipped over and ready to bake an additional 5 minutes. 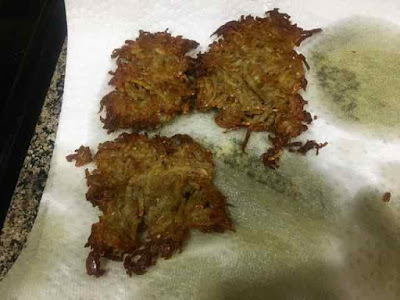 9) Drain latkes on paper towels. Draining excess oil on paper towels. 10) Serve right away for the crispest pancakes. If you want to make them ahead and then reheat: spread out the cold latkes on a shallow baking sheet and reheat in a hot oven (450℉) for about 6-8 minutes until heated through. 11) If you want to pan fry the latkes: Heat ¼ inch of oil in a frying pan over medium high heat. Do not start to fry until a piece of potato sizzles when dropped in the oil. Scoop out a portion of potato mixture and flatten with a spatula. Repeat until the pan is full about 4 pancakes. Cook 5-8 minutes until browned, but do not wait until the edges get dark or they will burn when the other side is cooking. Flip and cook 3-4 minutes on the other side. 12) Leftovers should be refrigerated or frozen and reheated as needed. 13) Traditionally these are served with applesauce and or sour cream, but you can eat them plain or with whatever you like. POTATO LATKES Makes about 6-8 three-inch latkes (enough for 2-3 people depending upon appetites) (double, triple etc. the recipe as needed) Ingredients 1 lb. Russet Potatoes (starchy potatoes are best) ¼ lb Onions 2 Tbs. Corn Starch (makes crispier latkes) or Potato Starch 1 large Egg ½ tsp. 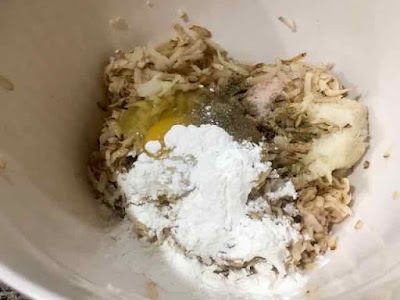 Baking Soda (makes the latkes less dense) ½ tsp. Sea Salt ¼ tsp. Pepper ½ to 1 cup Olive Oil for Oven Frying (Olive oil gives a great flavor) VEGAN POTATO LATKES Makes about 6-8 three-inch latkes (enough for 2-3 people depending upon appetites) (double, triple etc. the recipe as needed) Ingredients 2 Egg Replacers of choice (I used ¼ cup water, 2 Tbs. oil, and 4 tsp. baking powder.) 2 Tbs. Corn Starch (makes for crispier latkes) or Potato Starch ¼ tsp. Baking Powder (makes a less dense latke) ½ tsp. Sea Salt ¼ tsp. Pepper 1 lb. Russet Potatoes (starchy potatoes are best) ¼ lb. Onions ½ cup to 1 cup Olive Oil for Oven Frying (olive oil gives a great flavor) Directions 1) Preheat the oven to 450℉. 2) Pour ¼ inch oil into a rimmed baking pan. When the oven is preheated put the baking pan into the oven for 20 minutes to get the oil hot. 3) Wash and peel (peeling is optional) the potatoes. Using a box grater or the smaller grating blade on a food processor, grate the potatoes and place into a bowl of water, this will keep the potatoes from turning grayish. 4) Peel and finely grate the onion or run it through the food processor using the blade attachment. 5) Line a sieve with cheese cloth. Place as much of the grated potatoes in the cloth as will fit and still allow you to wrap them completely with the cloth. Gather the cheese cloth around the potatoes and form a knot or twist together the gathered ends and squeeze or wring all the moisture out of the potatoes. Repeat with the rest of the potatoes until all the extra moisture has been squeezed out. Repeat with the grated onions as well. Removing as much excess liquid as possible is crucial for getting a crisp pancake. 6) Add the grated potatoes and onions to a large bowl. Add the rest of the ingredients (except the cooking oil) and mix well. I find it best to use my clean hands to mix this up. 7) Carefully take the oil filled baking pan out of the oven and place on the stove top. Scoop out portions of the potato mixture into the oil and flatten the center. 8) Bake for 6-8 minutes or until browned and crisp. Turn the latkes and bake an additional 5-8 minutes depending upon how dark and crisp you prefer yours to be. 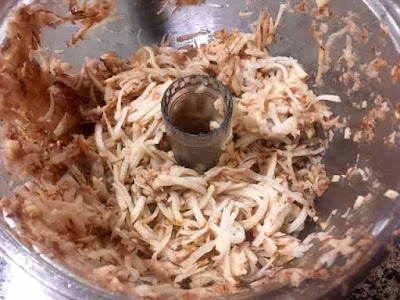 9) Drain latkes on paper towels. 10) Serve right away for the crispest pancakes. 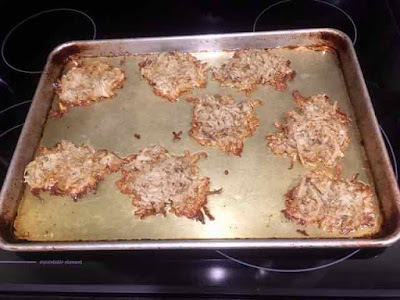 If you want to make them ahead and then reheat: spread out the cold latkes on a shallow baking sheet and reheat in a hot oven (450℉) for about 6-8 minutes until heated through. 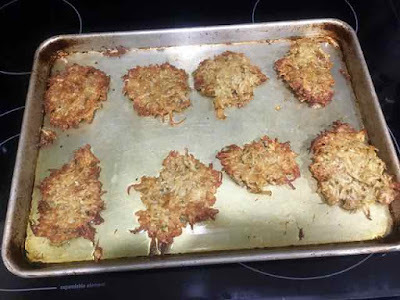 11) If you want to pan fry the latkes: Heat ¼ inch of oil in a frying pan over medium high heat. Do not start to fry until a piece of potato sizzles when dropped in the oil. Scoop out a portion of potato mixture and flatten with a spatula. Repeat until the pan is full about 4 pancakes. Cook 5-8 minutes until browned, but do not wait until the edges get dark or they will burn when the other side is cooking. Flip and cook 3-4 minutes on the other side. 12) Leftovers should be refrigerated or frozen and reheated as needed. 13) Traditionally these are served with applesauce and or sour cream, but you can eat them plain or with whatever you like.